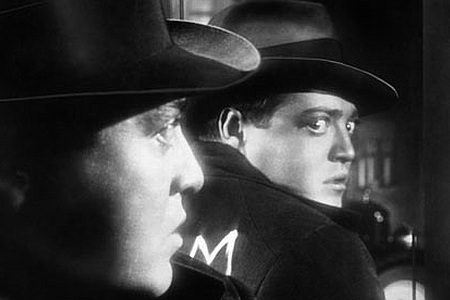 This week we took on Fritz Lang’s M (1931). Look out for clocks, files, records, book-keeping, accounts and other evidence of bureaucracy in action. Look out for communications networks and mass media. Look out for shop windows and other displays of commodities. Look out for mirror images/reflections and doublings. What is going on with the narrative structure? To what extent is this a film about the contest between a protagonist and an antagonist? To what extent is classical narrative structure subordinated to a series of images of the city connected by sound? How are those images arranged? How do they relate to each other? Pay attention to the ways the film uses sound (offscreen sound, sound from the following shot/scene present in the current scene, unusual sources of sound, silences). At the end of the film, is there any conclusive evidence of Hans Beckert’s (Peter Lorre) guilt? Clocks abound in this film (and other Lang films – see the Paternoster Machine in Metropolis for example) – from the child’s game that opens the film with clock-like movement to the pickpocket who calls the talking clock and then corrects all the stolen watches he is carrying; from the cuckoo clock in Frau Beckman’s apartment that signals the time as she waits for little Elsie to return home to the clocktower bells that drown it out. They signify the imposition of clock time on our experience of the world – imposed so the trains could run on time, to organize commerce, to discipline and control labour – and the ways in which this ordering of subjectivity also disorders us. Likewise, the gang of criminals come up with their own systematic means of finding the killer (because he is bad for business) – surveillance conducted by the army of beggars in the street; and then, when Beckert is trapped in the factory/office building, despatching teams of men to work through it in an orderly manner. We also thought about seriality – the children’s game, the serial fiction delivered to Frau Beckman as she waits for Elsie, the ordering of cigarettes and cigars and other objects in the beggars’ hideout, where food prices are listed in chalk as if share prices at a stock exchange. And of course serial killers, that modern and largely urban phenomenon, the US variety of which is typically said to start with HH Holmes in Chicago at the time of the 1893 World’s Fair (the subject of one of Edison’s early phonographs). The early twentieth century saw several notorious examples in Germany (Kürten, Grossmann, Denke, Haarmann), and they crop up in other German films of this period, such as Paul Leni’s Waxworks (1924), and The Lodger (1927), made under the influence of expressionism by Hitchcock shortly after his return from Germany to England (and remade in 1932 with sound by Maurice Elvey). Violence lurks everywhere in this film. The streets are populated with men injured in the war: limbs are missing, and the one set of fingerprints we see are those of a man with only four fingers; there are blind people and deaf people, people who fake being blind and a blind man who sometimes wishes he was deaf so as to cut out the constant noise of the city. There are also psychological traumas: the anxiety of parents (shared to an extent by the viewer who joins them in being worried about their children) and the bereavements they suffer. Lang at one point considered including a flashback to explain the origins of Beckert’s derangement in the horrors of World War One; but that would psychologise him, and like Brecht, Lang is more interested here in moving from ‘psychology to sociology, from empathy to critical distance, from organic development to montage, from suggestion to argument’. This is why the film narrative is decentred into montages of city scenes, without real protagonist or antagonist. It is about the social circumstances which enable serial killers (and other modern urban figures) to emerge, to thrive, to become a media spectacle. This is why we are not permitted – until the final scene – to develop any real sense of Beckert as a person with whom we might sympathise in some way. — German expressionist film (Wiene’s Cabinet of Dr Caligari, Genuine, Raskolnikov, Hands of Orlac, Martin’s From Morn to Midnight, Robison’s Warning Shadows) – though we only had time for clips from Caligari and the opening of Joe May’s Asphalt, which moves from actuality footage to expressionist images of the city, cuts to a calm domestic space, and then returns to expressionist images of the city (you can see it here.) Unlike Caligari, which films expressionist spaces and performances, Asphalt in places uses the camera and editing in an expressionist manner. — Neue Sachlichkeit (New Objectivity or New Matter-of-factness, New Sobriety or New Dispassion), a post-impressionist movement that tried to get away from subjective expression to a more political art intended to provoke collective action (examples included Otto Dix’s verist Salon, War Cripples and The Trench, and Alexander Kanoldt’s classicist Still Life II and Der rote Gürtel). We also took quick look at some footage from the great New Objectivity film People on Sunday (see it here). Lang, after all, called M a documentary! The conclusion that I did not have time to get to included the sneaky reference to Foucault mentioned above, and one to the Adorno and Horkheimer – their argument that in capitalist modernity economics and politics become increasingly intertwined: business interests intervene in the running of the state for their own ends; the state intervenes in the economy to maintain conditions favourable to business. This leads to centralised instrumentalist bureaucracies and administration. As instrumental reason dominates, social life becomes increasingly rationalised. Which kind of captures a large chunk of what M is up to. As in others of Lang’s German and US films, the city is the site of modernity, and this is what modernity looks (and sounds) like. – Gunning, Tom. The Films of Fritz Lang: Allegories of Visions and Modernity. London: BFI, 2000. See 163–199 on M.
– Kaes, Anton. M. London: BFI, 2000. – Roberts, Ian. German Expressionism. London: Wallflower, 2008. The key German expressionist novel is Alfred Döblin’s Berlin Alexanderplatz (1929). A more accessible vision of Germany in the Weimar period can be found in Christopher Isherwood’s Mr Norris Changes Trains (1935) and Goodbye to Berlin (1939), often bound together as The Berlin Stories or The Berlin Novels and adapted for film as I Am A Camera (Cornelius 1955) and Cabaret (Fosse 1972). Other serial killer fiction of interest includes Robert Louis Stevenson’s Strange Case of Dr Jekyll and Mr Hyde (1886), Patrick Hamilton’s Hangover Square: A Tale of Darkest Earl’s Court (1941), Dorothy B Hughes’s In a Lonely Place (1947), Jim Thompson’s The Killer Inside Me (1952), David Grubb’s The Night of the Hunter (1953), Bret Easton Ellis’s American Psycho (1991) and Susanna Moore’s In the Cut (1995). Erik Larson’s non-fiction account of HH Holmes and the Chicago World’s Fair, The Devil in the White City (2003), is also of interest. One of the innovations of American hardboiled crime fiction was the introduction of the detective who could go anywhere in the city, crossing physical space as well as class barriers – such as Raymond Chandler’s Philip Marlowe, introduced in The Big Sleep (1939) – which enables a similar overview of society as that offered in M.
Other German expressionist films about the city include The Last Laugh (Murnau 1924), Metropolis (Lang 1927), The Blue Angel (von Sternberg 1930) and – made in the US – Sunrise: A Song of Two Humans (Murnau 1927). German expressionism visually influenced American film noir, including adaptations of Chandler novels, such as Murder My Sweet (Dmytryk 1944) and The Big Sleep (Hawks 1946). Its impact can also be seen in such British films as Odd Man Out (Reed 1947) and The Third Man (Reed 1949). Point Blank (Boorman 1967), Se7en (Fincher 1995), The Underneath (Soderbergh 1995), Dark City (Proyas 1998), Fight Club (Fincher 1999) and The Deep End (McGehee and Siegel 2001) find ways to create expressionist effects in colour. Although it has expressionist elements, at the time of its release in Germany M was considered and example of New Objectivism, like People on Sunday (Siodmak and Ulmer 1930) and GW Pabst’s films of this period – Diary of a Lost Girl (1929), Pandora’s Box (1929), Westfront 1918 (1930) and The Threepenny Opera (19321 . The Wire (HBO 2002–08) maps the urban complexity behind crime, from street-level drug-dealing to corporate and political corruption. Spiral (Canal+ 2005–), The Killing (DR/ZDF 2007–12) and Peaky Blinders (BBC 2013 – ) do some similar things, although they are less astute about economics.